ST. GEORGE — The Utah Chapter of Juvenile Diabetes Research Foundation is putting on its sneakers for a community 5K walk on Saturday at 9 a.m., starting at the Virgin River Trailhead at the Crosby Family Confluence Park, 2099 S. Convention Center Drive, in St. George (south of the Dixie Center St. George). The Juvenile Diabetes Research Foundation hopes to raise over $79,000 to fund research to find better treatments, prevention methods and a cure for Type 1 diabetes and its complications. The disease affects more than 3 million Americans today; and 1 in 3 children born in the United States will develop Type 1 diabetes, according to the 2012 National Diabetes Fact Sheet. 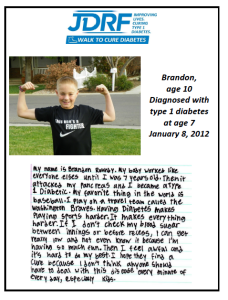 St. George resident Brandon Roundy has had Type 1 diabetes since he was 7. His mom and dad, Kristin and Cole, have been actively involved in fundraising for the Juvenile Diabetes Research Foundation since Brandon’s diagnosis. Their team, Brandon’s Band of Buddies, has raised nearly $6,000 over the past three years and hopes to add another $1,000 to their total this year. The Roundy family will be joined by hundreds of walkers — including numerous family teams like theirs, corporate teams and school teams — who come out each year to support the fundraising walk. On-site registration begins at 9 a.m. Saturday and a ceremonial ribbon-cutting will take place at 10 a.m. The ribbon will be cut by the brothers of local girl, Kycie Terry, who was diagnosed with Type 1 diabetes earlier this year and is in rehabilitation at Primary Children’s for a traumatic brain injury secondary to her diabetes diagnosis. Following the walk, a cookout lunch will be provided along with numerous carnival-style games for kids, face painting, bounce house, and rock wall. The walk is generously sponsored by many community partners, including Worker’s Compensation Fund, Parker Advisory Group, Carl’s Jr., Wendy’s, and the Yamagata Foundation. All of the funds raised will go towards the critical research being done to cure, treat, and prevent Type 1 diabetes.